It’s natural to start noticing some wrinkles and fine lines as you get older, but that doesn’t make aging any easier. If your skin is starting to look less youthful, you may want to consider starting on an anti-aging skin care regime! Luckily for you, we’ve compiled the best anti aging products so you can stop aging in its tracks and have more youthful, glowing skin. Want in? Take a look at our best anti aging skin care tips and products! From serums to toners to moisturizers, make sure you’re patting on your skin care products, rather than rubbing or massaging them in. Rubbing creates unnecessary friction and can cause irritation and even inflammation around the eyes. Patting is gentler and you minimize pulling on the skin. In fact, patting increases the absorption of the ingredients and stimulates your blood flow, so you get a natural glow! Retinoids (the prescription-strength version of vitamin A) help your skin produce more collagen. As we get older, we begin losing collagen, which is a protein that keeps our skin looking smooth and lifted. If you’re not ready for retinoids, there’s also a gentler version of vitamin A you can get over the counter called retinol. It’s formulated for sensitive skin and great if you haven’t started using retinoids yet! Neutrogrena’s Anti-Wrinkle Cream is a great one to start with. The sun is one of the main skin aging culprits. If you don’t wear sunscreen, you can be sure your skin will start aging at a quick pace, especially as you get older. This doesn’t mean only wearing sunscreen on beach days. The sun’s UV rays can get through whether it’s sunny or cloudy, summer or winter. You should be wearing sunscreen everyday if you want your skin to stay youthful. Regular exfoliation is key to ridding your skin of dead skin cells (did you know our skin sheds dead cells regularly and creates a new layer every 28 days?). Without exfoliation, your skin can end up looking rough and dull. Exfoliate weekly to remove build up for fresher looking skin! Antioxidants are amazing for your skin. Eat tons of fruits and veggies that are high in antioxidants such as vitamins B and E. Foods like salmon, chickpeas, sunflower seeds, blueberries, kale and almonds are awesome natural antioxidant sources! This hydrating anti-wrinkle face serum is formulated with hyaluronic acid to reduce pores, wrinkles and fine lines. In just 10 days, you’ll start to see the effects, and will have more luminous, plumped skin. This intensive concentrate was made with wrinkles and fine lines in mind. It’s a hydrating moisturizer that targets collagen III, also known as youth collagen, for powerful anti-aging effects! The powerful anti-aging ingredients in this cream reduce the appearance of wrinkles, and firm, tone and hydrate your skin. You’ll notice a transformation in just 15 days, visibly improving the youthfulness of your complexion. Your under eye area is one of the first places to show signs of aging. This anti-aging eye cream reduces signs of fatigue and eliminates puffiness and wrinkles! As I mentioned above, retinol is a vitamin A derivative. When it comes to your skin, it helps with everything from reducing acne to brightening your complexion, and of course, making your skin look younger. It’s added to skin care products to enhance skin renewal and boost the skin’s collagen production, assisting with anti-aging. You can also think of it like an antioxidant, as it fights free radical damage, which leads to visible signs of aging. If you’re over 30 and are starting to notice fine lines, it may be time to start implementing skin care products with retinol into your routine. Retinol will help diminish fine lines and wrinkles and can also reverse effects of sun damage. If you’re just starting out with retinol, you don’t want to overdo it. Using it every night can cause sensitivity and irritation. Start with two nights per week and slowly increase it as your skin gets used to the product. This concentrated treatment features retinol SA and hyaluronic acid to uncover healthier looking skin and diminish wrinkles. The hyaluronic acid adds plumping moisture to hydrate and rejuvenate the skin, and the retinol SA penetrates the skin, smoothing wrinkles and eliminating age spots. If you’re in the market for a retinol product with a higher strength, this anti-wrinkle cream is the one for you. It reduces the look of fine lines and deep wrinkles while you sleep, leaving your skin looking youthful and healthy. Apply to your face and neck at night when your skin is most receptive for repair and renewal, and wake up with beautiful skin! Along with retinol, this serum contains peptides that smooth the skin and minimize the appearance of wrinkles, plus a signature blend made up of hyaluronic acid, colloidal oatmeal, allantoin, aloe, ceramides and vitamins C and E to nourish, protect and boost the health of your skin. This 72% organic retinol serum will help you reverse signs of aging, giving your skin a youthful shine while making it look and feel young and rejuvenated. Their 10% pure vegan hyaluronic acid plumps your skin with moisture, and mixed with vitamin E, witch hazel, jojoba oil, green tea and other powerful ingredients, this retinol serum offers anti aging at its best. If you don’t take care of your skin, it can begin to show signs of aging sooner than it should. Keep your skin looking young and glowing with these anti-aging tips and products! 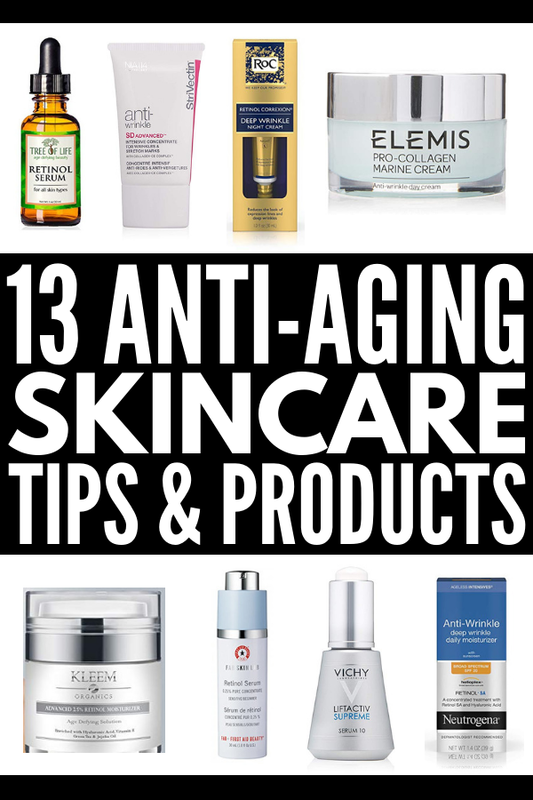 If you loved this post on anti aging skin care, please share it on Pinterest. And if you want more anti aging skin care advice, make sure to follow our Beauty Board on Pinterest.